It does not matter if you have the smallest of zits or an explosion of eczema and psoriasis; they are always accompanied by a lot of discomfort and heartburn. The best way to start tackling a skin ailment is to have a better idea about it. Though eczema and psoriasis have many things in common, the basic nature of the two conditions is different. Let us see how these conditions are different from each other. Eczema is a disease that is basically allergic in nature. It is your body’s way of responding to something it perceives as an irritant. For instance, you may be allergic to some detergents and soaps and this may cause your skin to break out into eczema. Eczema reveals itself as dry skin that may have some blisters on it. It may also have raised spots and an itch that drives you nuts! Psoriasis on the other hand, refers to red and rough skin that has a raised appearance. The area may or may not itch. The most visible difference between eczema and psoriasis is that the areas affected by psoriasis will usually have a scaly flaking that can even cause bleeding. 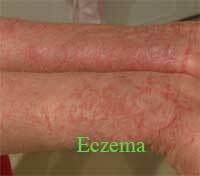 Another basic difference between eczema and psoriasis is that they are caused by different things. For instance, eczema is usually a sort of an allergic reaction of the body to some irritant. Psoriasis, on the other hand, is usually caused by a number of factors, most important among them being a genetic predisposition to the condition. What does that translate into? Well if you have the genetic predisposition to it and your skin encounters the irritants, you are most likely to have a psoriasis attack. While eczema can be avoided by not exposing your skin to the irritants, there is very little you can do about an attack of psoriasis. Another important difference between the two conditions is that while eczema is confined to the skin, psoriasis can have an adverse effect on the joints also. Psoriasis often causes symptoms of arthritis like pain on different joints. No matter what your condition is, it is very important for you to seek medical attention as soon as possible. Eczema can result in a lot of additional infections and the sooner you get medical help, the better you are able to control this situation. 1. Eczema is caused by allergic reactions of the body to irritants like detergent and soaps. Psoriasis on the other hand is usually genetic in nature. 2. The skin takes on a dry and flaky look in eczema and it will cause a lot of itching. Psoriasis is characterized by dry and patchy skin that is sometimes raised in nature. It may itch at times and may lead to the skin bleeding also. 3. The effects of eczema are confined to the skin only. The effects of psoriasis are also felt in the form of arthritic pain in the joints. Purpa Mukherjee. "Difference Between Eczema and Psoriasis." DifferenceBetween.net. September 19, 2009 < http://www.differencebetween.net/science/health/difference-between-eczema-and-psoriasis/ >. Treatments for eczema and psoriasis is another difference. Both of them will likely be treated with topical lotions, ointments, and creams.